SCVHistory.com LW2778 | Film-Arts | Actor Ken Maynard, 75; Sylmar-San Fernando Earthquake, 1971. 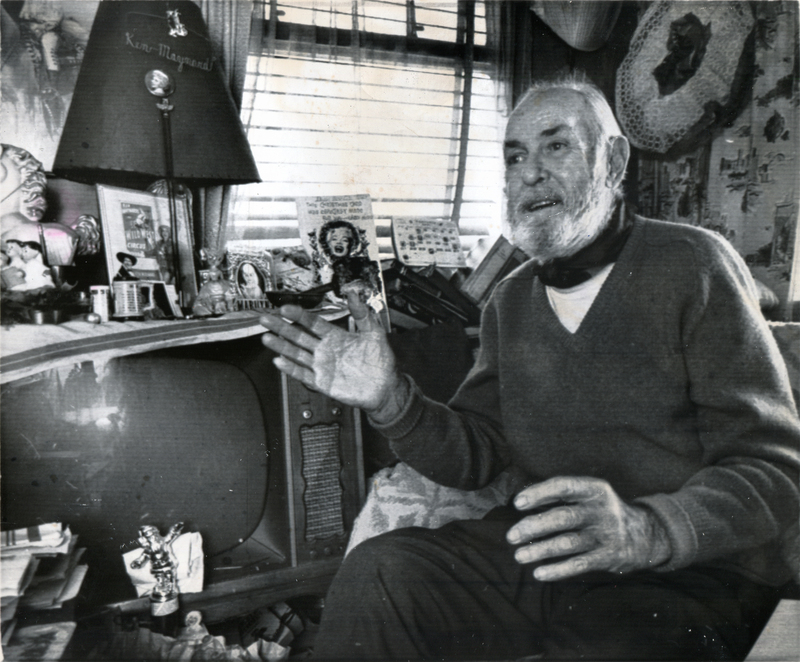 His days as a dashing silver screen star merely a memory, actor Ken Maynard (1895-1973) was living in a cramped trailer in San Fernando when the Sylmar-San Fernando Earthquake struck on Feb. 9, 1971. 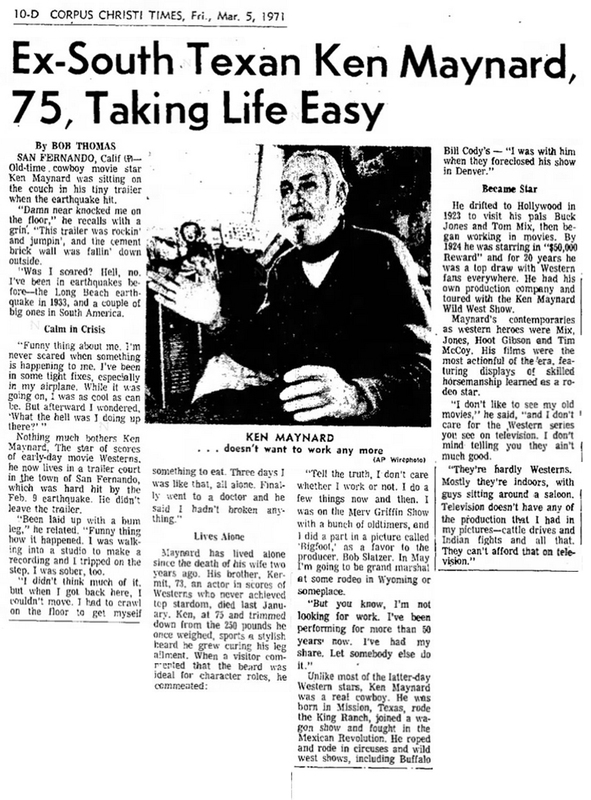 San Fernando, Cal., March 5 — Describes the Earthquake Feeling — Cowboy star Ken Maynard describes how he was sitting on the couch in his tiny trailer in San Fernando, Cal., when the earthquake hit Feb. 9. "The trailer was rockin' and jumpin'," Maynard recalls. The star of scores of movie westerns, Maynard says he doesn't care whether he works or not. "I've had my share. Let somebody else do it," he says. (AP Wirephoto) 1971. 8x11 glossy print (cutline is part of print) from the archive of The Baltimore Sun, which published it March 5, 1971. Read about Maynard and his Wonder Horse, Tarzan, here. Ex-South Texan Ken Maynard, 75, Taking Life Easy. By Bob Thomas | The Associated Press. As published in the Corpus Christi Times | Friday, March 5, 1971. San Fernando, Calif. (AP) — Old-time cowboy movie star Ken Maynard was sitting on the couch in his tiny trailer when the earthquake hit. "Damn near knocked me on the floor," he recalls with a grin. "This trailer was rockin' and jumpin', and the cement brick wall was fallin' down outside." "Was I scared? Hell, no, I've been in earthquakes before — the Long Beach earthquake in 1933, and a couple of big ones in South America. "Funny thing about me. I'm never scared when something is happening to me. I've been in some tight fixes, especially in my airplane. While it was going on, I was as cool as can be. But afterward I wondered, 'What the hell was I doing up there?'" Nothing much bothers Ken Maynard. The star of scores of early-day movie Westerns, he now lives in a trailer court in the town of San Fernando, which was hard hit by the Feb. 9 earthquake. He didn't leave the trailer. "Been laid up with a bum leg," he related. "Funny thing how it happened. I was walking into a studio to make a recording and I tripped on the step. I was sober, too." "I didn't think much of it, but when I got back here, I couldn't move. I had to crawl on the floor to get myself something to eat. Three days I was like that, all alone. Finally went to a doctor and he said I hadn't broken anything." "Tell the truth, I don't care whether I work or not. I do a few things now and then. I was on the Merv Griffin Show with a bunch of oldtimers, and I did a part in a picture called "Bigfoot," as a favor to the producer, Bob Slatzer. In May I'm going to be grand marshal at some rodeo in Wyoming or someplace. "But you know, I'm not looking for work. I've been performing for more than 50 years now. I've had my share. Let somebody else do it." Unlike most of the latter-day Western stars, Ken Maynard was a real cowboy. He was born in Mission, Texas, rode the King Ranch, joined a wagon show and fought in the Mexican Revolution. He roped and rode in circuses and wild west shows, including Buffalo Bill Cody's — "I was with him when they foreclosed his show in Denver." He drifted into Hollywood in 1923 to visit his pals Buck Jones and Tom Mix, then began working in movies. By 1924 he was starring in "$50,000 Reward" and for 20 years he was a top draw with Western fans everywhere. He had his own production company and toured with the Ken Maynard Wild West Show. Maynard's contemporaries as western heroes were Mix, Jones, Hoot Gibson and Tim McCoy. His films were the most actionful of the era, featuring displays of skilled horsemanship learned as a rodeo star. "I don't like to see my old movies," he said, "and I don't care for the Western series you see on television. I don't mind telling you they ain't much good. "They're hardly Westerns. Mostly they're indoors, with guys sitting around a saloon. Television doesn't have any of the production that I had in my pictures — cattle drives and Indian fights and all that. They can't afford that on television." LW2382a: 19200 dpi jpeg from original 8x11-inch glossy print purchased 2015 by Leon Worden.